The solar sails generate electricity from the panels fitted on the fabric and then store it in batteries for use around the clock. The energy is later converted to power lights, USB charge, AC outlet, and any electrical demand needs. Brooklyn-based flexible solar structures and products manufacturer Pvillion has created a new solar power canopy product the “Pvilion Solar Sail Canopy”. 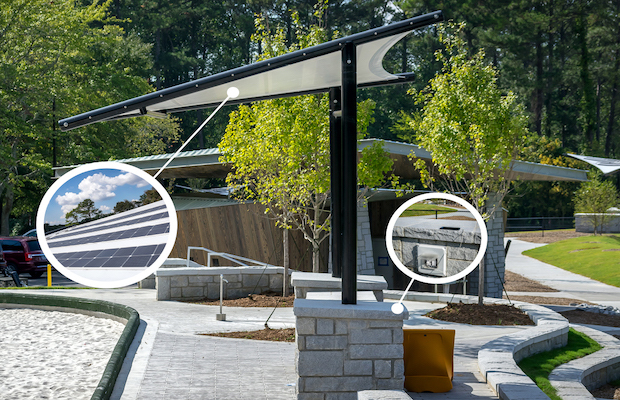 Using its proprietary lamination process, coupled with its expertise in tensile structure design, the has developed a permanent solar-powered canopy product that is scalable for providing its user’s shade and a source of power when needed. These innovative lightweight structures not only provide shade and solar energy but LED lighting and mobile charging using built-in USB ports. Either grid-tied or off-grid, Pvilion’s canopies are customisable with scalable battery back-up systems depending on the installation needs. The single pole solar sail, suitable for parks, beaches, and outdoor areas comes with a 15 A charge controller, 2 USB type electronic device ports, 2 LED wash lights and an 800 W rating for the solar energy output. The cantilevered double pole solar sail simultaneously provides shelter, shade, and energy. Ideal for placing over benches, seating, tables, and gathering spaces. With the design allowing free movement in and around the structure. It comes with a 500W solar energy output rating and similar configuration of ports and controller. The products come with a 20-year material warranty, and a solar output warranty of 80 percent rated power after 20-years of use.